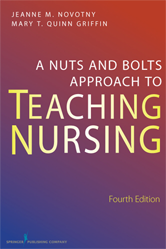 Editor/Author Griffin, Quinn Mary T.
Updated, revised, and expanded, this fourth edition of a "survival manual" for new teachers offers the most current thinking in nursing education, from practical nursing, to baccalaureate and master's programs. It also serves as a comprehensive guide for novice educators in classroom and clinical teaching settings. Chapters offer helpful strategies for making clinical assignments, preparing lectures and seminars, all aspects of testing and grading, supervision, facilitating group study, selecting textbooks, guiding independent study, and helping students improve their writing skills.